Reliability Predictions offer a key advantage as part of your overall reliability analysis toolset. Reliability Predictions are used to estimate the predicted failure rate or MTBF of a product or system during any portion of the product lifecycle. Reliability Predictions are performed based on widely accepted standards that use statistical-based equations to model the failure rates of components in your electromechanical systems. In the first part of our series, the standards and their underlying models were explained. In this second part of our series, we’ll discuss the additional features Relyence Reliability Prediction incorporates to make your prediction analyses effective and efficient. Relyence supports all these standards. If you are unfamiliar with these standards and would like a deep dive into their details, please check out Part 1 of this series, “Part 1: The Reliability Prediction Standards”. Relyence Reliability Prediction takes prediction analysis to the next level by adding on an impressive list of features to aid in your analysis activities. The central part of Relyence Reliability Prediction is the full implementation of all the prediction standards in a comprehensive and complete package. Building on this, Relyence introduces a well-rounded feature set that provides the capabilities you need to get your job done with ease and efficiency. Read on to learn about a few of these noteworthy features! Relyence supports model extensibility, or the ability for you to use unique features found in one reliability prediction standard across all prediction standards. Model extensibility enables you to mix-and-match features in a way most beneficial to your needs. For example, the types of components modeled in each standard vary. While there is a great deal of overlap, in some cases there are part types unique to a particular standard. With Relyence Reliability Prediction, you are not constrained by the list of parts in one standard: as long as the part is modeled in one standard, it is available in all. So you can select MIL-HDBK-217 as your main prediction standard, but if your analysis includes a component not present in MIL-HDBK-217, but is available in Telcordia, you simply indicate that component utilize the Telcordia standard for analysis. Also, you can combine features across models. For example, Telcordia includes calculation adjustment equations for incorporating laboratory test data and/or field data into reliability predictions. With model extensibility, you can use that same methodology in your MIL-HDBK-217 analysis. The value of model extensibility means that your reliability predictions are more complete, more accurate, and ultimately more valuable in helping you to achieve your product reliability goals. The Relyence Dashboard is one of the highlights of the Relyence tool suite. Providing insight into all your reliability and quality metrics at a glance, the Relyence Dashboard enables you to keep an eye on your system at a high level to monitor any and all aspects you deem critical. Importantly, Relyence Dashboards allow you to act proactively to address problems early on, avoiding larger issues later. You can create as many dashboards as you would like for different team members, different uses, different projects, or according to any type of breakdown that would be most helpful. Or, you can simply create one overreaching dashboard that provides a cross-module overview of all your reliability metrics. Basically, the choice is yours! Failure Rate Percentage: A pie chart showing the failure rate percentages of your subsystems. Failure Rate vs Environment: A line chart of failure rate values over a specified range of environments. Failure Rate vs Temperature: A line chart of failure rate values over a specified range of temperatures. First Year Dropout Rate: A line chart of the failure rates during the first year of operation based on early life data. Overstressed Parts: A listing of overstressed parts. Parts Contributing 80% of Failure Rate: A bar chart of the parts whose failure rates contribute to 80% of the overall Analysis failure rate. Subsystem Failure Rate: A bar chart of the failure rates of subsystems. Tagged Parts: A listing of tagged parts, or parts you have marked for further review or evaluation. Top 10 Highest Failure Rate Parts: A bar chart of the parts with the 10 highest failure rate values. 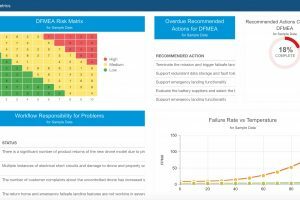 You can create a custom Relyence Reliability Prediction dashboard using any combination of these widgets to evaluate and track your most important reliability prediction metrics. Relyence Reliability Prediction elevates the parts-level failure rate modeling of the prediction standards to a system modeling tool through the use of two key features: the Analysis Tree and the Analysis Diagram. In Relyence Reliability Prediction, you can utilize either one or both of these capabilities to help model a more complex system. The Relyence Analysis Tree is used to create a hierarchical breakdown of your product into subsystems. Using the Drone Example supplied with Relyence, the Drone represents the complete drone assembly. You could delineate all the component parts of the drone in a single parts list. However, in the Drone Example, the Drone has been broken down into subsystems: the Motherboard, the GPS, and the Ground Controller. This is a subjective breakdown we used for this example, and can be easily modified as needed for your specific use, and can be as granular as your would like. Using Relyence’s Analysis Tree, you can define the subsystems of your product and their relationship in a hierarchical fashion. When Relyence performs the prediction calculations, the computed failure rates of the parts will be rolled up through the Analysis Tree. Using the Analysis Tree makes it easier for you to focus on specific segments of your products as needed, assign different teams to different subsystems for analysis, or simply to better organize your reliability prediction for better understanding. The Analysis Diagram can be used to create a graphical representation of your product or system. This visual system overview uses block to represent subsystems and connection lines to define the associations between subsystems. Relyence will automatically generate an Analysis Diagram based on your Analysis Tree to start, then you can edit and rearrange as you desire. The Relyence Analysis Diagram supports images, so you can create impressive looking visual diagrams! 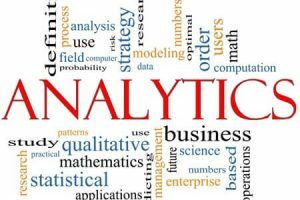 Reliability prediction calculations use equations that are based on the electromechanical devices in your product along with their associated data parameters. For example, the equations for modeling the failure rate of integrated circuits include data such as number of gates, number of pins, etc. The equations for resistors include data such as resistance value and rated power. Relyence Reliability Prediction offers two mechanisms for making the data gathering process more efficient: the Relyence Library and you own Parts Library database. Relyence is supplied with a built-in database of commonly used components. As you enter a Part Number in to the Relyence Parts Table, the Relyence Parts Library is searched for matching parts. If a match is found, the device data is automatically retrieved and pulled into your Analysis. You can also create and continually build up your own Parts Library of components. This Parts Library will be automatically searched along with the Relyence Parts Library when entering Part Numbers in your prediction analysis. There are a number of ways to add parts to your own Parts Library: enter them directly, copy and paste from Excel files, or add the parts from an existing Analysis. Either or both of the Parts Libraries can be optionally enabled and disabled for searching. As noted, reliability prediction equations are based on devices and their associated data parameters. Oftentimes, especially in early design, data parameters may be unknown or not finalized. When using Relyence Reliability Prediction, you can leave any unknown data parameters blank. Relyence incorporates a set of default values based on “average” use that enables you to perform analyses with minimal data input. As you refine your design, you can go back and add in the data parameters as they become known. The value of adding in the actual values is that your prediction will be more attuned to your specific design. Additionally, Relyence Reliability Prediction enables you to create a set of your own default values to use for data parameters left blank. For example, you may not want to use Relyence’s built-in “average” values, but would prefer to use either more pessimistic or optimistic values. The My Defaults features enables you to do that. Relyence Reliability Prediction, as all Relyence products, has been designed and built with complete customization in mind. Each organization and each team is unique and wants the ability to adapt their analysis tools to meet their own needs. Relyence capably handles this requirement. On the front end user interface, Relyence Reliability Prediction allows you to create customized Views of your data. Your worksheet tables can be customized to include, or not include, data fields; you can rename column headings, change column order, and group fields under a group title. You can create as many different data Views as you would like and optionally share Views with team members. Relyence Reliability Prediction generates reports based on your customized data Views. This means that you have complete control over your output reports, and can create any number of different reports for different uses. You can export your reports to a number of formats, and can optionally include your own logo on your reports. While not part of any standard, reliability predictions are valuable when used to perform trade-off and What-If? analyses. Using Relyence makes these types of analyses much easier to accomplish. For example, you can evaluate how your product reliability will be affected by a change in operating conditions, such as temperatures or environments. Change these data parameters in your Analysis, rerun your calculation, and run a quick comparison. Or, you could answer the question, “What if I procure my devices at a higher quality level?” and evaluate how this affects product reliability. You can mix-and-match components, perhaps evaluating how reusing a subsystem from a previous design compares with the newly designed subsystem. 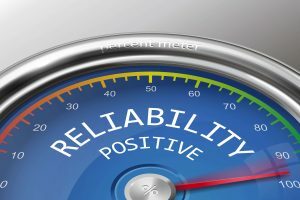 It is one of the ways reliability predictions can be used to aid in meeting your overall reliability objectives. 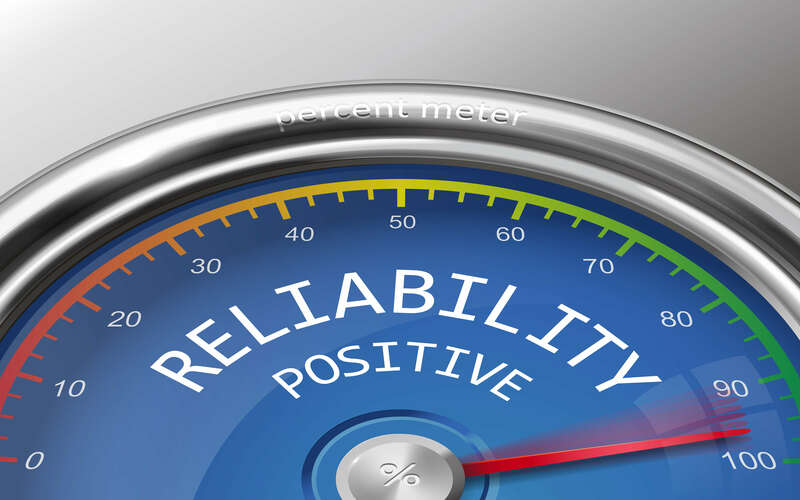 In addition to the quantitative analysis, you can assess reliability metrics at a qualitative level – is this better or worse? In the end, your reliability prediction analyses provide another important tool in your reliability analysis toolbox, enabling you to meet and maintain your product reliability goals. At Relyence, our mission is to build not only the most capable tools, but also the most technologically advanced and well-crafted applications available. We rely on our expertise to build the tools reliability experts expect, and couple that with a design elegance and utility that makes our tool suite stand out. We offer completely free, no obligation trials, as well as webinars, video walk-throughs, and personal demos to help you move to reliability excellence with Relyence. Check us out today! Register for your free trial, or feel free to contact us, or give us a call today at 724.832.1900 to discuss your requirements. Tags: China's GJB/z 299dashboardGJB/z 299MIL-HDBK-217Model ExtensibilityParts LibrariesReliabilityreliability predictionReliability Prediction Standardssystem modelingTelcordiaTrade-offWhat-If?